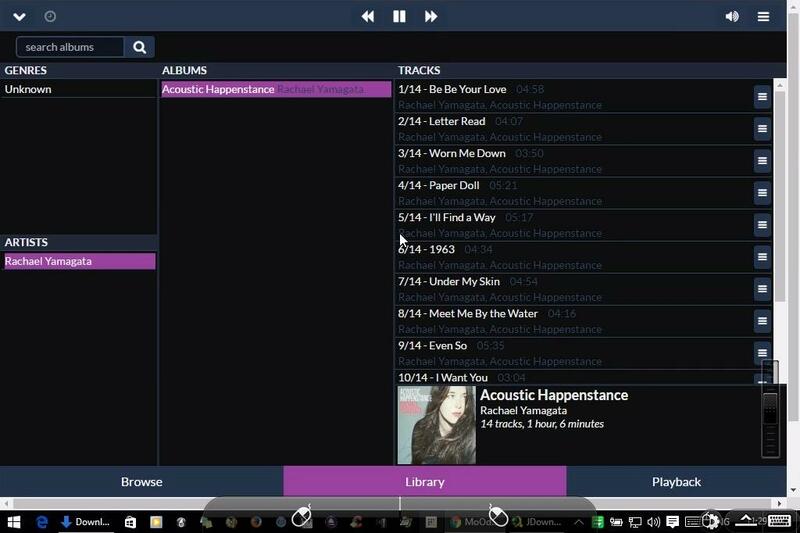 Mambo Media Player audio review from TNT-Audio.com professionals. My curiosity about alternative digital audio was piqued by the latest new product announcement – a shiny silver box that serves music from a stored library or online streaming services. And for a mere $5000! The basic tenet of the sales pitch was «do you really want the hassle of setting up a PC-based or other system, why not just buy a made-for-purpose product?». I wondered the opposite – how can I do it at low cost and easily without hassle? The Mambo Media HiFi Player is one answer to my question. Essentially, it’s a Raspberry Pi B+ credit-card size PC and credit-card size (65 x 55 mm) Mamboberry HiFi DAC+ mounted in a box with an external power supply adaptor, and software installed and configured. For more than 40 years my hi-fi attention has been on electronic components in large metal cases, typically 17″ wide, so the idea of a high definition digital file player and Internet radio streamer in a tiny box with a small price needed to be investigated. I approached this product as an audiophile curious to test for myself the claims that truly high definition music playback quality is available simply by combining low-cost off-the-shelf assemblies. I requested a low-cost plug-n-play high quality media player – and that’s what I got – and more. Collybia sell the boards and also now do the assembly and audio player software set-up to sell a tailorable plug-and-play media box configuration. 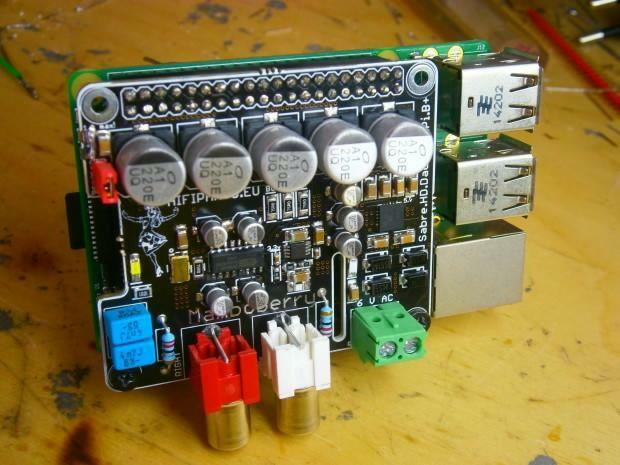 This uses the ESS Sabre ES9023p DAC chip and Sigma/Delta PCM 24 bit – 192 kHz architecture with Linux kernel 4.1.16 v7+. In other words, the DAC is high definition and associated with a PC board with open source operating system and music player daemon. In this case, the front-end is the MoOde Audio Player which can play DSD, and the media box can also handle DXD at 352.8 kHz. The design concept was to eliminate jitter, and Collybia claim to have achieved this. I note that this solution comes from a computer firm rather than a home audio producer. Why would you use such a product when there are many very arty and glitzy big boxes offered elsewhere for music serving duties? Firstly, the low cost is a real eye-opener. High definition playback is promised, making this a tempting consideration for audiophiles. The box is very small, allowing the unit to be hidden away if desired. The unit is silent and does not get hot, using only about 4 W and so there is no fan to dirty the electrical signals. The PC is headless requiring no dedicated monitor, and control via a web browser is oh so easy and effective. 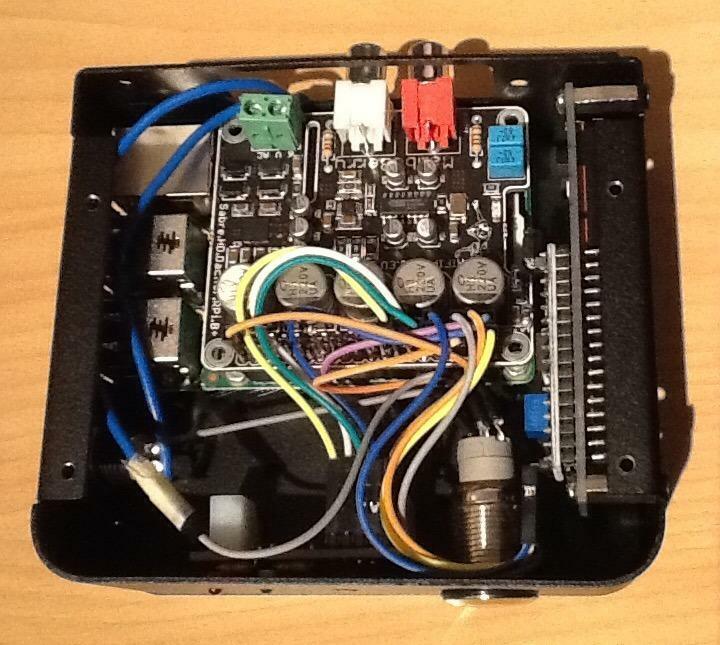 The 9 V – 1 A linear power supply is external and ultra-low noise. The unit supplied is mounted in a black aluminium box just 110 x 100 x 42 mm (white is also available), with a green LED panel (other colours are available), and MoOde installed (Archphile or RuneAudio are also available). An SD card reader can be included – options are selectable on the website ordering page. Before powering on, I plugged in a USB stick with FLAC files loaded and attached a CAT5 cable network connection. The media box will also operate on a wireless connection, but this is not recommended by Collybia and I didn’t try it. A network connection is essential to enable control through a web browser on a PC or tablet. I used the Discovery app on my iPad to get the IP address for the device and found the user interface on the network (see photos) by typing this as the URL in my Google Chrome browser. 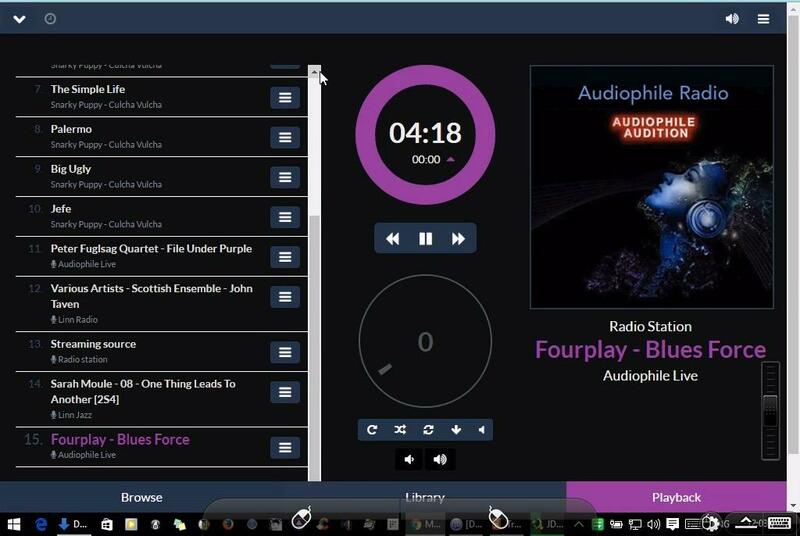 This gave me control over player on/off, settings, browsing sources (USB, Internet radio), library of files and searching, playlist, volume, and of course play. to play music files from a USB stick (or externally-powered USB hard disk drive). A small remote control device is supplied and this was quite effective for start/stop, pause, volume, and moving back and forth among adjacent files. The range seems to be very short (no more than a metre? ), so this is not a way to control the unit from the couch, but it does add functions that don’t have buttons on the box itself. Clear line of sight with the IR receiver was essential, and one snag is that the IR receiver is not on the same face as the LED display which shows file titles. Control through a web browser which also allows source, network, system, and MPD configuration and interface customisation. Sonic quality of playback of my FLAC files is astonishingly good. I have used a Cambridge DACMagic and SoTM HD interface for several years, and recently also tried a Carat-Peridot USB DAC from StyleAudio (South Korea), and iFi iPurifier and USB Disruptor. The Mambo is crisper, very dynamic, and tonally very engaging. For a couple of weeks now, the others have been switched off, and the Mambo has become my preferred player with the MPD configuration set to SoX very high quality (24 bit – 192 kHz, 175 dB noise rejection, linear phase). I’m loving the sound of my digital albums! From Collybia Team we would like to thank Richard Varey for his acceptance to review our product and his professionalism. Please all our readers to support tnt-audio.com It is an independent and very professional audio review site. PrevPreviousNEWS: VOLUMIO RC2 is released!